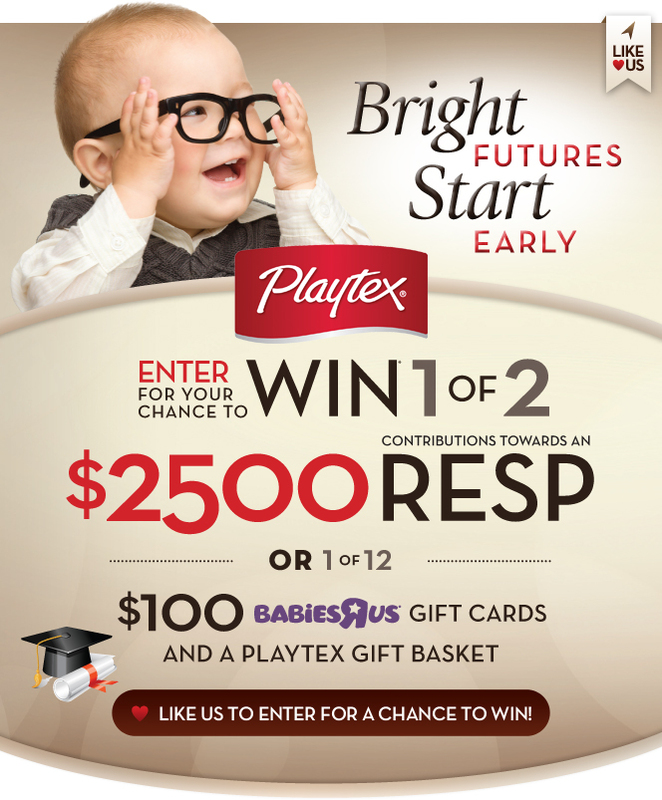 You are here: Home / Family / Bright Futures Start Early: Enter the Playtex Babies R Us Contest for a Chance to Win a $2,500 RESP! There really isn’t a handbook and especially if you are expecting your first child, the anticipation alone can be overwhelming. Though there is no handbook, there are many resources that you can find when you are entering the world of motherhood. There’s books, courses and even the advice of your own mother. But, something that I found most valuable during my journey as a mom of 2, were online resources and in particular– Playtex Mommyville! The site combines expert advice, support and tips for women from the prenatal stage through the first few crucial years of motherhood and offers solutions and support to make life easier on a daily basis. Playtexmommyville.ca offers a range of tools and downloads, such as a baby tracker to monitor patterns in baby’s daily activities, a baby proofing checklist and an immunization chart. You can also find tons of useful articles on hot topics for moms, coupon offers, and an events listing page to help moms find other women in their community. You can also enter a monthly sweepstakes, get in on special offers, create a personalized profile and much more! Playtex is a trusted brand in our family, we’ve used them since our first baby over 8 years ago and still use them now for our youngest. It isn’t a surprise that they are offering such a great service to new moms and veteran moms alike. Expecting or Know Someone Who Is? A part of being a mom, whether new or veteran, is thinking about our children’s futures. As soon as I could, I started early on saving for the girls’ futures and all mothers agree that looking ahead is so very important. Right now, you can enter through the Playtex Mommyville Facebook page for a chance to win 1 of 2 $2500 contributions towards an RESP or 1 of 12 $100 Babies ‘R’ Us gift cards plus a Playtex gift basket! With the Playtex Babies R Us Contest, you could be well on your way to starting! Have you started saving for your kiddos yet? Disclosure: This post was sponsored by Playtex in participation with SheBlogs Media. Playtex is a licensed trademark. © 2012 Playtex Products, LLC. All opinions and thoughts are my own and have not been influenced in any way. Please see WI’s disclosure. Saving is the hardest thing. I wish I could say that yes we have education savings. It is scary because my oldest is in grade nine…university is right around the corner and she is going to have to take out loans. I haven't started saving for my sons education yet. My friends and I were just discussing this today. I really need to get on it, my oldest is 2 years old. School is just getting more and more expensive so savings are a must. Great post. I have a family RESP for my two children. We contribute a small amount each month. It may not be much right now, but one day it will all add up and definitely help out when they branch out to college and/or university. My recent post WW – Halloween Fun!